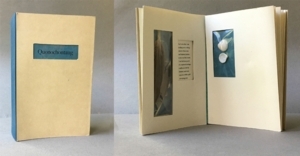 In this workshop you will construct a simple storage book made of folded card stock in which windows have been cut, held together with a spine. What is stored need not be flat, although it is easier to work with pieces that are less than about 1/16 inch thick. We will be making a model and then, if time, a more fully realized book. Images and thin objects to be stored will be provided, but participants are welcome to bring their own. All needed tools will be supplied, but, if you have them, bring any of the following: scissors, glue stick, X-Acto knife, cutting mat, pens/pencils, and ruler. If you’ll need some nourishment during that time, bring it with you. Susan Viguers is a book artist, writer, and editor. She recently retired from teaching in and heading the MFA Book Arts/Printmaking program at the University for the Arts. Her artist books have been collected by over 60 public institutions in the US and abroad. This free workshop will take place 10 AM-1 PM in Room 407, 4th floor of the Parkway Central Library.